Have you found an online vendor selling Mount Gay Eclipse Black? MG eclipse black is a good beginners rum, robust enough to mix in a cocktail or rum punch without getting lost yet smooth enough to sip. You will find this expression has many of the common rum traits it makes a great entry level baseline to compare the rums best suited to just mixing to the smoother prestige sippers. This rum at least in the USA was discontinued sadly. There are a few dusty bottles left in my location at several stores. I bought two, one to drink one to collect. This rum needs time to breath at its heftier 50% ABV. The blend is aged about 2-7 years Let it sit in the glass for a good while and let it open up a bit. Aroma after breathing has a nice spice to it, alcohol wafting through the breeze. The tasting is classic bajan, with a nice bite. A nice classic strong spice hit on the palate. A classic example of how Bajan rum should taste. This at 50% does not feel that high of an ABV. Incredible smoothness on its finish no bitterness. The finish lasts for a long while, nice spice that lasts. If you can still find one I suggest the buy. An easy sipper for me..
All you would want from an overproof, very rich flavour, a bit of sting and it will get you drunk faster than the regular stuff. This was exactly what I was looking for relative to Mt. Gay Eclipse, much more concentrated taste. I know they're meant to be a different blend, but I find that MG Eclipse is like this with water. I recommend black on the rocks (where there is some burn, but not as much as some reviews would have it) or with coconut water or coke. Really stands up to all mixers and is well priced too. At around $20 this rum is a screaming bargain. It shares some of the interesting qualities of its outstanding big brother Extra Old, and is bottled at 100 proof, though still sippable neat. This rum is good for cocktails and mixes, the uninitiated rum drinker shouldn't start here, as it may overpower you, falls below Black Barrel and way down from the XO. It still has that rich Mount Gay flavour but is not as smooth as some of it's more well known family. Taste 5/10. Mount Gay is very dry similar to whisky. If you tell me if this is whisky or rum i would say a bourbon. This is not rum! Had a rum tasting on a sunny afternoon, because why not. 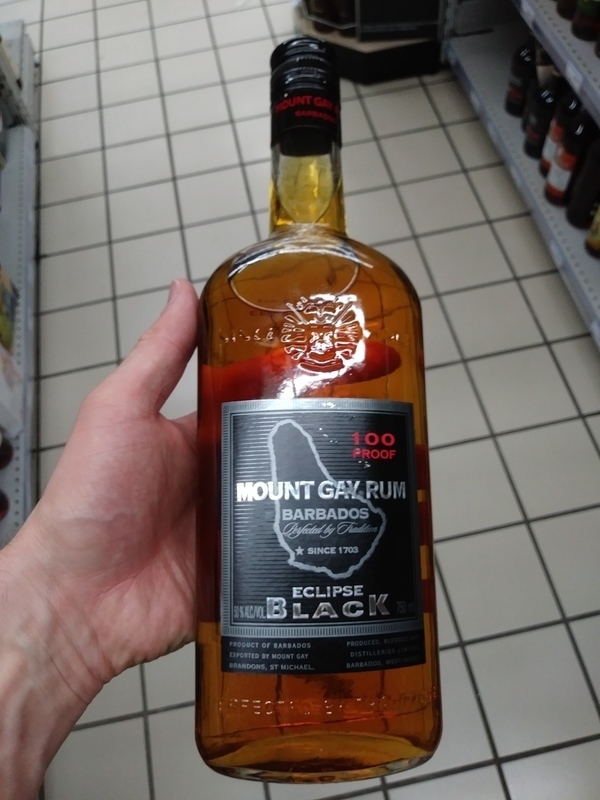 Mount Gay Eclipse Black Rum bottle and label design looks pretty decent. Wood, dryness and smokiness coming through to the nose and palate. Quite a harsh burn at the end, so better to mix it up. Not my cup of tea. Standard supermarket £15 on offer it's worth grabbing as a mixer. This rum took me back to my early years in which I loved rum and simple life style. Made out of molasses and the purest water found in the beautiful Barbados. I spent many sunsets i that island sipping this rum paired with fine cigars. Unforgetable experience. Bon rhum mais prédominance de l'alcool et pas assez de palette aromatique à mon sens. 50% ABV. A fine nose. No astringency. Very dry. Tastes of caramel and charred oak. Quite nice! Short finish. Picked this up on sale for 23$ and was surprised. It wasn't too smoky or harsh, but it wasn't amazing either. A little too harsh straight up, but is fine with cola or diluted with some ice. excelent good bajan rum.smooth drinking on the rocks.even greater for mixing.quality product. A very smooth running but I prefer the sharpness of Eclipse. Lovely flavour and good aftertaste. Mellower than the eclipse which means a little less coke and slightly more enjoyable rum characteristic. Výborný rum! Výrazná chuť, typická vůňe. Stoji za to si vychutnat! This rum is good ! My friend didn't know what was the quality of the product when he bought the bottle. Recommanded by the seller, we are not desapointed of our choice. Maybe a bit too strong taste, there is a excellant flavor of caramel ! Excellente qualité, ça commence avec un gout de caramel et se poursuit longtemps par un mélange de saveur complexe chêne,vanille et noix. J'envisage déjà acheter ma 4 ieme bouteille.